L. E. Munn will start work today, Thursday on his new business block on Main Street, and operations will be rushed to early completion. The new structure will be a beautiful addition to the business section and a credit to the town. It will be of brick and steel construction, two stories in height with a frontage of 43 ft. and depth of 28 ft. The first floor will be occupied by Mr. Munn’s confectionery, ice cream store and restaurant, while the second floor will be finished off into living apartments. The new structure will be built up and around, Mr. Munn’s present one-story business place, permitting business of the establishment to proceed uninterrupted while construction work is in progress. Mr. Munn is to be congratulated on his enterprise and confidence is Smethport’s future in erecting this fine business block. The Builders’ Supply Company of Bradford, contractors on the new business block of L. E. Munn and the store building being erected by H. C. Wells, on Main Street, is making rapid progress on those new brick structures. The handsome new Munn block and the Wells building which will fill in the space between the Munn block and the Wells’ drug store building, will greatly enhance the appearance or that section of Main Street. A deal of importance was consummated in this borough last Friday by which L. E. Munn purchased from Forrest Williams of Mt. Jewett the fine two-story brick business block on Main Street, Smethport, adjoining Mr. Munn’s restaurant building, now occupied by the Fetterly Drug Store. 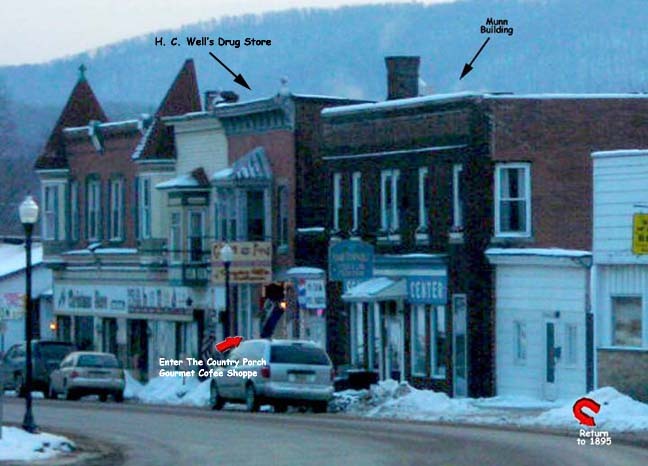 In connection with this real estate transfer, the consideration of which is private, it is stated that the Fetterly Drug Co., the headquarters of which is in Port Allegany, will move its local store to Coudersport the first of next month, entirely abandoning the Smethport business field. It is understood that Mr. Munn will connect the newly purchased building with his restaurant building with a runway and will use the store quarters for his ice cream parlor and confectionery business, using his present large business place for restaurant purposes exclusively. The second floor will be finished off into a number of attractive rooms to enable this popular establishment to provide rooms as well as meals to patrons which will prove a real accommodation to the traveling public. This property which was originally built by H. C. Wells and was occupied by the pioneer Wells Drug Store for many years up to 1926, when Mr. Wells sold out and moved to Olean, where he established a store, is one of the most modern on Main Street.